Comfortable apartments in a quiet position, magnificent garden with heated pool, infrared sauna, homemade products for breakfast, only 20 minutes on foot from the city centre. Welcome to Residence Neuhäuslhof*** in Meran! The apartments of Residence Neuhäuslhof are located in Obermais, the green villa district of Meran, in a quiet and sunny panoramic position. Our apartments are surrounded by our own fruit orchards and vineyards and is situated only 20 minutes on foot from the city centre of Meran. Enjoy the hearty hospitality, the inviting atmosphere and the magnificent view over Dorf Tirol, Schenna and the surrounding mountain world. Our guests are offered 10 comfortable apartments (2-4 persons), which are furnished with much love for details and with any comfort. They all dispose of a fully equipped kitchenette, a spacious bathroom, with shower, WC, bidet and hairdryer, phone, safe, satellite TV and balcony. Bed linen, towels and kitchen linen are available. Due to parquet and laminate floors and special blankets and pillows, the apartments are ideal also for allergy sufferers. For breakfast, you can buy homemade and regional products such as jams, fresh rolls, eggs from the mountain farm, self-made yogurt and much more in our shop. A fully automatic coffee machine will delight you with tasty cappuccinos, espressos and hot chocolates. Relax in our spacious garden with sunbathing lawn and heated pool, which is available from the end of April to the middle of October. 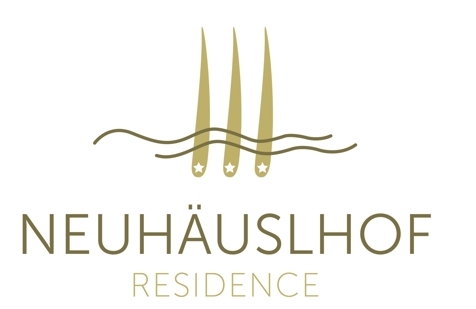 As well, Neuhäuslhof offers and infrared sauna. As we are partners of the thermal baths of Meran, our guests are offered voucher for avoiding queues. Meran and environs offers countless leisure time activities at any season and for any taste. Directly in front of our house, you will find wonderful hiking paths, excursions and bike tours. With MeranCard, you can use all means of public transport in South Tyrol for free and benefit from many other advantages, such as free entry to more than 80 museums.